In 1996 Robert and Karen Karri-Davies planted their 15 acres vineyard on the headwaters of the Willyabrup Valley using natural organic biological principles. Cover crops of clover peas and rye grass are grown between the vines. 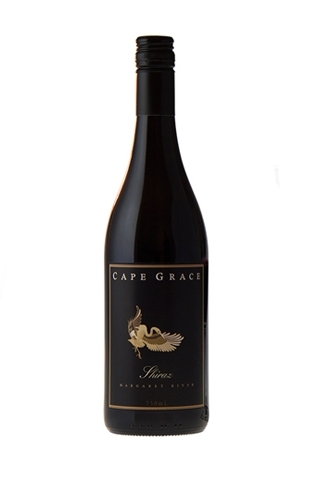 Cape Grace consistently produces exceptional “Single Vineyard Wines” and have received 3 trophies and over 175 medals. In James Halliday’s Australian Companion, in the 2004 edition, Cape Grace was privileged to be included in the “Ten of the Best New Wineries” listing and has currently received a Red 5 star Winery Rating. With a limited annual production of only 2000 cases, the wines are sold primarily at the Cellar Door and mail order. But, I have managed to persuade Karen and Robert to let me have an exclusive small mixed parcel of their wines for the UK market. The total production of this wine is just 275 dozen bottles. The grapes were picked in the cool of the morning, matured for 12 months in 50% new French oak barrels and 50% 1 and 2 year old French oak barrels. Blended and bottled in July 2016. An elegant first-rate juicy Margaret River Shiraz with luscious raspberry, black cherry and white pepper notes with a touch of Chinese five spice on the nose. The palate consists of rich plums and berry fruit, with hints of aniseed, mocha and mixed spice combining with red berry acidity and smooth resolved fine tannins to create a wine with exemplary balance and length. This is for immediate enjoyment or will cellar up to about 8 years. 92/100 Ray Jordan, 91 Points Gary Walsh.